I’ve decided to start a regular series on the blog called “Today at Kingsford” (the name of our little lake). It’s been something I’ve toyed with from time to time in the past, and I’d been giving more serious thought to since moving here. Our current location provides me with more material than I can possibly post about, particularly the sort of long, researched posts that tend to accompany most of my photos (a “problem” I didn’t have when I was living in the city). Beyond that, there are many neat things here that it would be difficult to make a full-length post about, but I would still like to share. This will be that forum. Today’s photo is a good example of that. It started raining yesterday evening, and through the night. When I got up this morning, early, with the intention of going out to do some birding (thinking perhaps the scattered showers through the night may have downed some migrants, or otherwise kept yesterday’s from leaving), it was pouring. Wet, wet, wet. I wasn’t going anywhere. So instead I rolled over for another hour of sleep. When I did finally get out of bed, and looked out the bedroom window at the trees and forest, the rich colours of the lichen on this tree trunk jumped out at me. 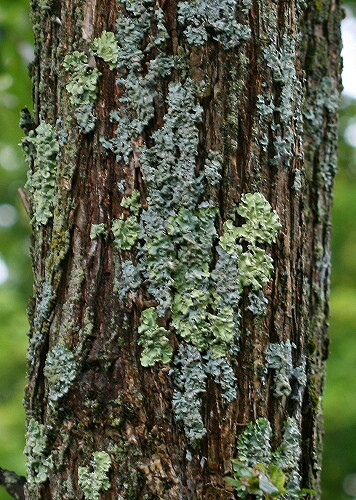 I find lichen that can really blend in with a tree on an ordinary day looks beautifully vibrant after a rain, with the darkened rain-soaked bark providing strong contrast to the brilliant pale greens and blues. Now, I wasn’t about to make a whole post on lichen in the rain, and a photo such as that would just languish on my hard drive, perhaps popping up once in a while on my screen saver slideshow. My hope is that these short posts will be “filler”, for the days in between the longer posts. There will still be days I don’t post anything at all, but while I don’t have the time to do a full-length post every day, I should have time most days to at least put up a photo and paragraph of explanation. “Lichen in the Rain” , wasn’t that a Neil Sedaka hit from the 70s? It’s true, the green and blue really distinguish themselves after a good soaking. “Today at Kingsford” is a good idea, a(n ir)regular short post, without having to go the more generalist “Wordless Wednesday” route.